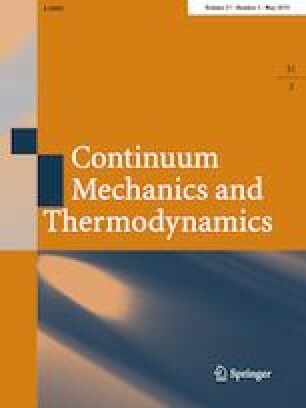 Entropy principles based on thermodynamic consistency requirements are widely used for constitutive modeling in continuum mechanics, providing physical constraints on a priori unknown constitutive functions. The well-known Müller–Liu procedure is based on Liu’s lemma for linear systems. While the Müller–Liu algorithm works well for basic models with simple constitutive dependencies, it cannot take into account nonlinear relationships that exist between higher derivatives of the fields in the cases of more complex constitutive dependencies. The current contribution presents a general solution set-based procedure, which, for a model system of differential equations, respects the geometry of the solution manifold, and yields a set of constraint equations on the unknown constitutive functions, which are necessary and sufficient conditions for the entropy production to stay nonnegative for any solution of the model. Similarly to the Müller–Liu procedure, the solution set approach is algorithmic, its output being a set of constraint equations and a residual entropy inequality. The solution set method is applicable to virtually any physical model, allows for arbitrary initially postulated forms of the constitutive dependencies, and does not use artificial constructs like Lagrange multipliers. A Maple implementation makes the solution set method computationally straightforward and useful for the constitutive modeling of complex systems. Several computational examples are considered, in particular models of gas, anisotropic fluid, and granular flow dynamics. The resulting constitutive function forms are analyzed, and comparisons are provided. It is shown how the solution set entropy principle can yield classification problems, leading to several complementary sets of admissible constitutive functions; such classification problems have not previously appeared in the constitutive modeling literature. The online version of this article ( https://doi.org/10.1007/s00161-018-0737-4) contains supplementary material, which is available to authorized users.